Two of the principal requirements in ultrasonic (UT) systems for non-destructive evaluation and medical diagnostics are the high lateral (frontal) and axial (depth) resolutions throughout a large depth of field. These requirements can be met if the piezoelectric UT transducer (transmitter-receiver) used in the system forms a narrow weakly diverging ultrasonic beam within a large axial range (collimated beam) and has a broad frequency band (transmits and receives short UT pulses). Detailed investigation (theoretical and experimental) of the collimating piezotransducers forming narrow weakly diverging acoustic beams within the required axial range has been presented in . Thorough theoretical and experimental study of the wide-band piezotransducers transmitting and receiving short UT pulses has been given in . This paper describes the experimental results of measurement of acoustic fields and spectra of different novel piezoelectric transducers with logarithmic lenses  and with non-uniform electric fields . The former are capable of creating a specified acoustic field and are very promising in providing good lateral resolution over a large depth of field. The latter have a broad frequency band and the ability to generate short UT pulses thus providing good axial resolution. At the same time, all of these transducers are simple, inexpensive and can be manufactured in a variety of sizes to match the application. The techniques described in  allow calculating various acoustic lenses with different logarithmic profiles. The shape of a typical logarithmic acoustic lens is shown in Fig. 1. Such a lens forms a narrow weakly diverging acoustic beam throughout the required axial range. The central part of the lens focuses the UT waves close to the transducer (blue rays in Fig. 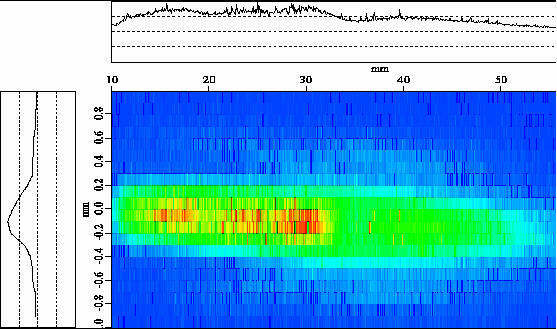 1), while the peripheral part of the lens focus the UT waves far from the transducer (red rays in Fig. 1). In other words, a logarithmic lens is a focusing acoustic lens with a varying focal length: small for the central part of the lens and large for the peripheral part of the lens. As a result, the acoustic field created by such a transducer has a stretched focal zone, where the UT beam is narrow and collimated. By changing the lens shape, the beam diameter and length of focal zone can be controlled. Although a logarithmic lens is not the best technique to form a narrow collimated beam (see  for details), it is the simplest and most energetically efficient way to do it. A transducer with an axially symmetric logarithmic acoustic lens will form a narrow axially symmetric weakly diverging UT beam. A transducer with a cylindrical logarithmic lens will create a "knife-like" ultrasonic beam: narrow and weakly diverging in one direction but wide and uniform in the perpendicular direction. If the logarithmic surface of the lens is attached to the piezoelement and the front (radiating) surface is flat the probe can be used as both an immersion and a contact transducer. At the same time, this transducer has a stretched focal zone, providing focusing within a large axial range. The logarithmic lens can be machined e.g. on the inner surface of a removable delay line. The cavity between the lens and probe's flat surface should be filled with oil or some other suitable material to facilitate coupling. Acoustic logarithmic lenses (spherical and cylindrical) with different dimensions, within the specified axial ranges were calculated for transducers with various center frequencies. Piezoelectric probes with these lenses were manufactured at UTX, Inc. (Holmes, NY). Piezoelectric materials such as PZT-5H piezo-ceramic, 1-3 piezo-composite and lead metaniobate K83, were used as the active elements. Round and rectangular element geometries were used for spherically and cylindrically focused transducers respectively. All probes were highly damped to produce broad bandwidth. The lenses were cast from epoxy and had the required logarithmic profile. Transducer diameters of 6.35, 9.5 and 15.9 mm and center frequencies of 10, 15 and 20 MHz were used. Besides the immersion probes, a few contact transducers with removable acrylic delay lines were manufactured. Logarithmic acoustic lenses were machined on the inner surface of the delay lines and the cavities between the lens and active element were filled in with oil. All transducers had metal cases with standard connectors. The acoustic fields of different transducers with logarithmic lenses were measured in an immersion tank in pulse-echo (PE) mode according to standard techniques . A 1.5mm stainless steel ball was used as a test target (reflector) and a UTEX UT-340 pulser-receiver was used for transducer excitation. The immersion tank had a computerized scanning bridge that allowed motion of the ball-reflector in three dimensions with 0.25mm accuracy. Note that in accordance with  the ball-target diameter should be greater than at least ten wavelengths of transducer center frequency in water. It makes the reflector non-directional, allows examination of small spatial variations in the acoustic field, while at the same time producing a sufficient energy response. The results showing acoustic fields of different transducers with logarithmic lenses are presented in Figs. 2-10. Color pictures show the axial-radial cross-section of the probes acoustic field, where color determines the intensity of the acoustic field (PE response amplitude). The top graph represents the amplitude distribution along the transducers axial axis. The left graph gives the amplitude distribution in the radial direction (beam profile). Fig 2: Axial-radial cross-section of acoustic field of an immersion transducer with logarithmic lens. Measured in immersion tank in PE mode with 1.5mm ball-reflector. Probe made from lead metaniobate Keramos K-83, aperture diameter D=9.5mm, center frequency f=20MHz, focal zone FZ=20-55mm at -6dB level (see top graph), beam diameter d= 0.4mm at -6dB level (see left graph). Radial and axial coordinate axes are shown on the left and on the top respectively. Fig 3: Axial-radial cross-section of acoustic field of immersion transducer with logarithmic lens. Measured in immersion tank in PE mode with 1.5mm ball-reflector. 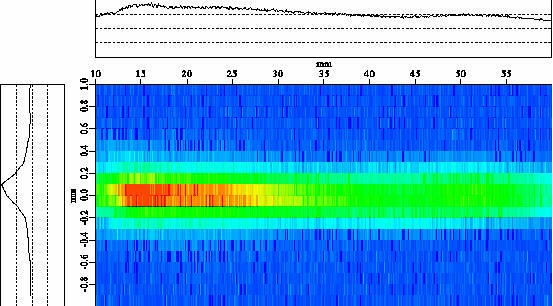 Probe from K-83, D=6.35mm, f=20MHz, FZ=5-17mm at -6dB level (see top graph), d= 0.2mm at -6dB level (see left graph). Color scale and coordinate axes are shown in Fig. 2. Fig 4: Axial-radial cross-section of acoustic field of immersion transducer with logarithmic lens. Measured in immersion tank in PE mode with 1.5mm ball-reflector. Probe from K-83, D=9.5mm, f=15MHz, FZ=10-70mm at -6dB level (see top graph), d= 0.6mm at -6dB level (see left graph). Color scale and coordinate axes are shown in Fig. 2. Fig 5: Axial-radial cross-section of acoustic field of immersion transducer with logarithmic lens. Measured in immersion tank in PE mode with 1.5mm ball-reflector. Probe from K-83, D=9.5mm, f=15MHz, FZ=10-50mm at -6dB level (see top graph), d= 0.4mm at -6dB level (see left graph). Color scale and coordinate axes are shown in Fig. 2. Fig 6: Axial-radial cross-section of acoustic field of immersion transducer with logarithmic lens. Measured in immersion tank in PE mode with 1.5mm ball-reflector. Probe from K-83, D=9.5mm, f=10MHz, FZ=10-55mm at -6dB level (see top graph), d= 0.8mm at -6dB level (see left graph). Color scale and coordinate axes are shown in Fig. 2. Fig 7: Axial-radial cross-section of acoustic field of immersion transducer with logarithmic lens. Measured in immersion tank in PE mode with 1.5mm ball-reflector. Probe from K-83, D=15.9mm, f=20MHz, FZ=15-60mm at -6dB level (see top graph), d= 0.4mm at -6dB level (see left graph). Color scale and coordinate axes are shown in Fig. 2. Fig 8: Axial-radial cross-section of acoustic field of immersion transducer with logarithmic lens. Measured in immersion tank in PE mode with 1.5mm ball-reflector. Probe from K-83, D=15.9mm, f=20MHz, FZ=10-55mm at -6dB level (see top graph), d= 0.4mm at -6dB level (see left graph). Color scale and coordinate axes are shown in Fig. 2. Fig 9: Axial-radial cross-section of acoustic field of contact transducer with logarithmic lens. Measured in immersion tank in PE mode with 1.5mm ball-reflector. 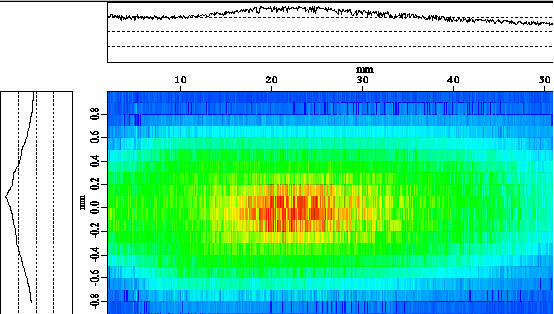 Probe from PZT-5H, D=6.35mm, f=15MHz, FZ=0-45mm at -6dB level (see top graph), d= 0.8mm at -6dB level (see left graph). Color scale and coordinate axes are shown in Fig. 2. Fig 10: Axial-radial cross-section of the acoustic field of a contact transducer with logarithmic lens. Measured in an immersion tank in PE mode with a 1.5mm ball-reflector. 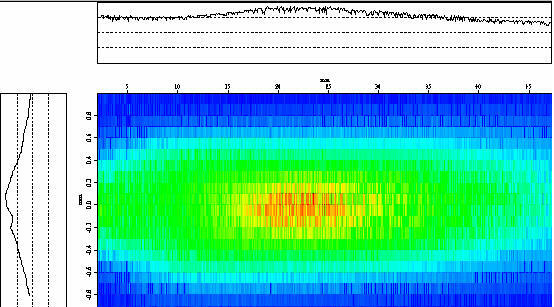 Probe from PZT-5H, D=6.35mm, f=15MHz, FZ=0-40mm at -6dB level (see top graph), d= 0.8mm at -6dB level (see left graph). Color scale and coordinate axes are shown in Fig. 2. Figs. 2-10 clearly demonstrate that transducers with logarithmic lenses create narrow collimated acoustic beams. The length of the focal zone and UT beam diameter depends on the lens shape, probe aperture, diameter and center frequency. For example, Fig. 2 shows that a logarithmic acoustic lens of 9.5mm diameter attached to a 20MHz piezoelectric disk can create a UT beam 0.4mm diameter at -6dB level stretched from 20mm to 55mm. Recall that if a transducers aperture diameter and center frequency are fixed, the beam diameter and length of the focal zone can be controlled by changing the shape of the lens. Logarithmic lenses can be employed in various types of transducers: immersion and contact, spherically and cylindrically focused, high and low frequency, large and small, non-damped and highly damped, and so on. The techniques described in  allow calculating various wide-band piezoelements with non-uniform electric fields. Typical conical wide-band piezoelements are shown in Fig. 11. Standard transducers using piezoelectric disks with two electrodes on the faces have two main sources of acoustic waves in the transmission mode and two main sources of electric charge in the reception mode. This happens because in the transmission mode the source intensity of the acoustic waves is proportional to the spatial derivative of the product of the electric field multiplied by the piezo-modulus. And in the reception mode the source intensity of the electric charge is proportional to the spatial derivative of the product of the mechanical strain multiplied by the piezo-modulus . In a standard piezo-disk with two solid electrodes on the bases these two products have discontinuities at the bases and respectively both derivatives are equal to infinity. As a result, the main sources of acoustic waves (in transmission mode) and electric charges (in reception mode) with maximum amplitude are located at the bases of piezo-disk. All other sources are much weaker. In the wide-band piezoelements with non-uniform electric fields shown in Fig. 11 these main sources are located in the peripheral areas on the cone base (see  for details). Besides this, there are multiple reflections of UT waves inside standard piezoelectric disks. In the wide-band transducers shown in Fig. 11 the multiple reflections of UT waves inside the piezoelements are eliminated due to conical shape of the piezoelements . Finally, transducers with non-uniform electric fields have only one area with one main source of acoustic waves in the transmission mode and one main source of electric charges in the reception mode. Secondly, the conical shape of the piezoelements excludes any possible internal reflections of UT pulses. As a result, these transducers are wide-band and can transmit and receive short UT pulses. By changing the shape of the piezoelement and the placement of the electrodes, the probe bandwidth can be controlled. Fig 11: Typical wide-band conical piezoelements with non-uniform electric field. Wide-band conical piezoelements with non-uniform electric fields were calculated for various transducers. Then UT probes with these piezoelements were manufactured at UTX Inc. (Holmes, NY). Piezoelectric materials such as PZT-5H piezo-ceramic and 1-3 piezo-composite were used to make the piezoelements. All transducers had thin protective layers and metal cases with standard connectors. Conical piezoelements had diameters of 9.5 and 12.7mm and heights of 12.7 and 22mm. All of these probes can be used as both immersion and contact transducers. The frequency response of various wide-band transducers with conical piezoelements and non-uniform electric fields were measured in an immersion tank in PE mode according to standard technique . A 3.2mm stainless steel ball reflector was used as a test target. A UTEX UT-340 pulser-receiver was used for transducer excitation. Note that in accordance with  the diameter of ball-target reflector should be greater than at least ten wavelengths of transducer center frequency in water. The pulser provided shock excitation with a pulse duration of 7 ns, at which the spectrum of applied energies is sufficient to accurately describe the frequency response of the transducer. The receiver's amplifier had a bandwidth from 1 MHz to 150MHz at -3dB and the digitizer of the receiver provided a minimum ten samples per cycle at the nominal frequency of the probe. The returning echo of the signal was gated such that the gate was wider than the echo to ensure that the rising and decaying portions of the waveform were included in the frequency response analysis. The distance between the transducer and the ball-reflector was adjusted for maximum amplitude response from the target. The results showing frequency responses of different wide-band transducers with non-uniform electric fields are presented in Figs.12-13. The top graph represents transducer PE response in the time domain within the wide gate from 0 to 60 s in order to demonstrate the shape of the whole PE response, the amplitude of the signal, and the signal-to-noise ratio. The medium graph zoomed from the top graph, shows the PE signal reflected from the ball-target in the time domain within the narrow gate. The bottom graph shows the frequency spectrum of PE signal reflected from the ball-target. Fig 12: Measured frequency response of a PZT-5H conical transducer in an immersion tank. Cone piezoelement with belt electrode on the cone side surface: base diameter 9.5mm and cone height 22mm. Reflector is a steel ball 3.2mm diameter located at 33mm from probe face (at the middle of focal zone). Graph a - the measured output voltage of the PE response in the time domain within wide gate from 0 to 50 s. Graph b - the measured output voltage of the PE reflection from the ball-target in the time domain within narrow gate from 41.5 s to 44.5 s zoomed from graph a. Graph c - the spectrum of ball-target reflection in frequency domain. Fig 13: Measured frequency response of a PZT-5H conical transducer in an immersion tank. Cone piezoelement with two electrodes on the cone base: base diameter 9.5mm and cone height 22mm. Reflector is steel ball 3.2mm diameter located at 33mm from the probe face (at the middle of focal zone). Graph a - the measured output voltage of the PE response in the time domain within wide gate from 0 to 60 s. Graph b - the measured output voltage of the PE reflection from ball-target in the time domain within narrow gate from 42.5 s to 45.5 s zoomed from graph a. Graph c - the spectrum of ball-target reflection in the frequency domain. As one can see from Figs. 12-13, transducers with conical piezoelements and a non-uniform exciting electric field have a rather low noise level and comparatively wide frequency band. Naturally, the bandwidth and signal-to-noise ratio are different for different probes, since these parameters depend on piezoelement shape and electrode placement. 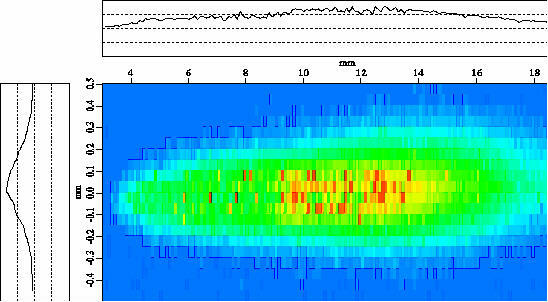 Strictly speaking, the spectra shown in Figs. 12-13 represent not only frequency properties of the transducers, but of the whole system: generator, amplifier, digitizer, and ball-reflector . The wide-band digitizer and rather large ball-target with smooth surface insignificantly affect the response shape and its spectrum. At the same time, the generator loaded with transducer and amplifier with 1MHz lower frequency cutoff do not provide the desired -function transmission and reception and affect the system spectrum . In order to get the "pure" transducer spectrum, one should remove the non-ideal generator and amplifier spectra from the obtained system spectrum by using the deconvolution (or normalization) technique described e.g. in . This method is based on division of the PE response spectrum (system spectrum) by the reference spectrum . A typical reference spectrum of the employed system (spectrum of the excitation pulse generated by UTEX pulser and passed through the receiver amplifier) is shown in Fig. 14.
b) Fig 14: Measured frequency response of UTEX UT-340 pulser-receiver loaded with transducer. Graph a - the measured output voltage in the time domain. Graph b - the spectrum of the response. Two deconvolved (normalized) spectra of the conical piezoelements, one with belt electrode and the other with both electrodes on cone base, obtained for the transmission mode by using results shown in Figs. 12c, 13c and 14b, are presented in Figs. 15-16. 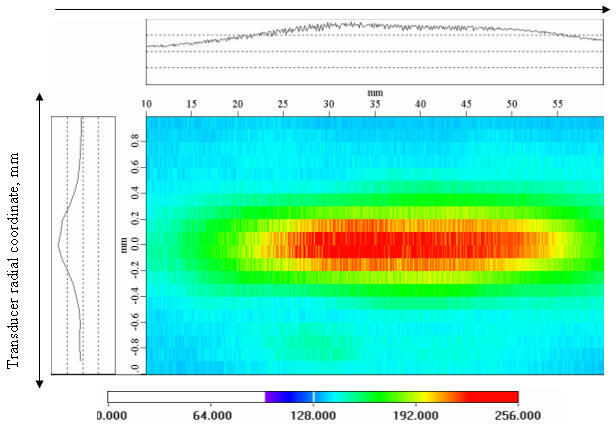 Fig 15: Calculated deconvolved (normalized) spectrum of wide-band conical piezoelement with belt electrode on cone side surface in transmission mode. Cone base diameter 9.5mm and cone height 22mm. Fig 16: Calculated deconvolved (normalized) spectrum of wide-band conical piezoelement with both electrodes on cone base in transmission mode. Cone base diameter 9.5mm and cone height 22mm. One can see in Figs. 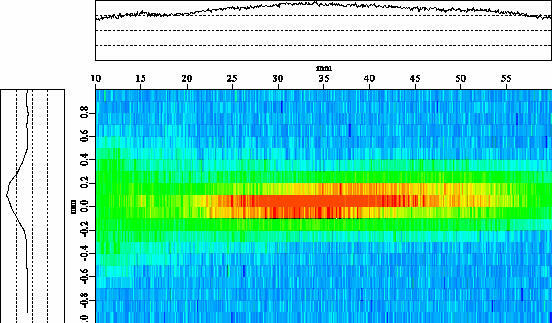 15-16 that the deconvolved transducer spectra in the transmission mode have a rather broad frequency band. These results confirm that conical transducers with a non-uniform exciting electric field are wide-band probes. Conical wide-band transducers with a non-uniform electric field can be used as both immersion and contact low-noise probes. They can be large or small, round or rectangular, focused (spherically, cylindrically, etc) and non-focused, and so on. These probes can transmit and receive short UT pulses with rather high signal-to-noise ratios, thus providing high axial resolution of the system. And at last, they can be employed as both high- and low-frequency probes depending on the application. The wide-band transducers with a non-uniform electric field create at the same time the narrow weakly diverging acoustic beam . This feature is a result of non-uniform excitation; that was explained and analyzed in . The length of the focal zone and the beam diameter can be controlled by varying the cone dimensions, electrode placement and size. However, these changes entail the variation of the frequency response too. To control the acoustic field of the transducer independently, one can use e.g. logarithmic lens at the cone base made from epoxy coating. The influence of such a lens on the probes acoustic field significantly exceeds the effect of the non-uniform electric field. The results of acoustic field measurements of wide-band conical transducers with logarithmic lenses, designed and manufactured in UTX Inc. (Holmes, NY), were presented in . Thus, the wide-band transducer with non-uniform electric field and logarithmic acoustic lens is capable not only to transmit and receive short UT pulses, but also to form a narrow collimated acoustic beam. This means that two useful features - the wide frequency band and the ability to create a narrow collimated beam - can be combined in one probe. Conical transducers with a non-uniform electric field and logarithmic acoustic lenses can be employed as a wide-band collimating low-noise probes. Now compare the sensitivity of the collimating probes with logarithmic lenses and wide-band conical transducers with a non-uniform electric field with the sensitivity of standard commercial UT probes. In general sensitivity is understood as an ability of the UT system to detect and characterize some specified flaw. Subsequently, the sensitivity of a piezotransducer in a broad sense should be defined in the same way. However usually the sensitivity (or relative amplitude sensitivity) of a probe is understood in a narrower sense as a ratio of the output signal amplitude to the input signal amplitude . Such a ratio is typically used to quantitatively evaluate transducer sensitivity. The response amplitude of a standard UT probe can be calculated by using some equivalent circuit (Mason, Redwood, KLM circuit or others) or system of the equations of piezoeffect. However, the equations of piezoeffect are very complex (see e.g. ). The equivalent circuits providing an adequate description of the piezotransducer are rather complex too. So to obtain an estimate of piezotransducer sensitivity an approximate method can be employed. The evaluation of the piezoelement relative sensitivity presented in this section is based on the simplest one-dimensional model. All secondary piezoelectric effects (direct and inverse) are neglected. Moreover, even the distributions of acoustic parameters (stress and strain) in the transmission mode and acoustic and electric parameters (stress, strain, electric field, and electric displacement) in the reception mode inside the piezoelement along one remaining dimension (piezoelement axial axis) are considered to be constant. Using these approximations, the following estimates of the piezotransducer sensitivity can be obtained. where Y is the Young's modulus of the piezomaterial, T1 = 2Zmed / (Ztrans + Zmed) is the pressure transmission coefficient in the outgoing wave at the interface transducer/medium, Zmed and Ztrans are the characteristic acoustic impedances of the external medium and transducer respectively, B is the degree of piezoelement damping depending on the multiple reflections in the piezoelement (B ~ 5-20 for the resonant probe and B ~ 2-4 for a wide-band transducer), L1 is the coefficient depending on the generator output electric impedance Zelgen (typically this impedance is just a pure resistance, i.e. Zelgen ~ Relgen ~ 50 Ω and transducer input electric impedance Zeltrans (typically, since piezotransducer is a pure capacitor, Zeltrans -j/ωC), j= -1, ω is the circular frequency of UT wave, C = e0 e33S/d is the transducer capacitance, S is the area of piezoelement, d33 is the piezoelectric modulus, d= l/2=c/2f is the thickness of piezoelement, e is the UT wavelength in piezomaterial, c is the speed of ultrasound in piezomaterial, f= ω/2p is the UT linear frequency (piezoelement resonant frequency), e0 = 8.85 10-12F/m is the free space (vacuum) dielectric constant (permittivity), e33 is the permittivity of piezomaterial, assuming that complex RC-circuit (generator and transducer) forms a divider we obtain that L1= 1 / [1 + (ωCRelgen)2], G is the UT intensity gain of the transducer acoustic lens. where Zmed = rmcm, rm is the density of the external medium, cm is the speed of longitudinal UT wave in this medium. where Ifoc is the UT intensity of the focused transducer in the focal point, Inonfoc is the UT intensity of the similar non-focused transducer in the same point, S is the aperture area of the probe, lm is the UT wavelength in the medium, F is the focal length in the medium. Typically the gain G of spherical acoustic lenses is G ~ 2-30 depending on the acoustic wavelength lm (i.e. transducer frequency f = cm / lm), focal length F, and area S.
where T2 = 2Ztrans / (Ztrans + Zmed) is the pressure transmission coefficient in the returning wave at the interface transducer/medium, we assume that input acoustic pressure Pin is constant over surface S of the piezoelement (if it is not, one should take the average pressure value), L2 is the coefficient depending on the input electric impedance Zelamp of the voltage amplifier (typically in the commercial pulser-receivers this impedance is just a pure resistance, i.e. Zelamp ~ Relamp ~ 50Ω ), assuming that complex RC-circuit (transducer and voltage amplifier) forms a divider we obtain that L2 = ωCRelgen / [1 + (ωCRelgen)2], lens gain G appears in formula (6) because of the reciprocity principle and characterizes the ability of focused transducer in the reception mode to provide large amplitude response to a weak signal coming from the focal point. Combining the obtained results and taking into account e.g. two external media with some target-reflector, one can determine the relative amplitude sensitivity of transducer in the PE mode (ratio of amplitude of the output electric voltage Uout to amplitude of the input electric voltage Uin applied to the transducer). where M is the absorption coefficient in both media (it depends on their lengths and UT frequency, e.g. for fluid M ~ ω2), R is the pressure reflection coefficient of the target located inside the 2nd medium (it depends on the target material, shape and size), product L1L2 = ωCZelgen-amp / [1 + (ωCZelgen-amp)2] determines the electric voltage transfer from generator to transducer in the transmission mode and from transducer to amplifier in the reception mode, T01 = 2Z1med / (Ztrans + Z1med) is the pressure transmission coefficient in the outgoing wave at the interface transducer/1st medium, T10 = 2Ztrans / (Ztrans + Z1med) is the pressure transmission coefficient in the returning wave at the interface transducer/1st medium, T12 = 2Z2med / (Z2med + Z1med) is the pressure transmission coefficient in the outgoing wave at the interface 1st medium/2nd medium, T21 = 2Z1med / (Z2med + Z1med) is the pressure transmission coefficient in the returning wave at the interface 1st medium/2nd medium. Recall that all the obtained formulae (1)-(9) are estimates, since they are based on the approximate model of the piezotransducer. Use formulae (1)-(9) to evaluate the relative amplitude sensitivity of the developed collimating transducers. As one can see from these formulae, the acoustic lens provides a significant increase in the transducer response amplitude. However the collimating probe should give the lesser gain, since its stretched focal zone DL is greater than depth of field Dd of the focused transducer. This gain is typically H ~ 2-10, since the spherically focused probes usually concentrate UT power within much smaller range than the collimating transducers with logarithmic lenses, which were specifically designed to provide the large stretched focal zone. In comparison with standard non-focused probes the collimating transducers with logarithmic lenses provide gain K ~ 2-10 depending on the length of focal zone, probe frequency and aperture diameter. The experimental results, performed by measuring response amplitude in the PE mode for various non-focused, collimating and spherically focused transducers, confirmed correctness of the obtained values H and K.
Now use formulae (1)-(9) to evaluate the relative amplitude sensitivity of the developed wide-band conical transducers. These formulae show that the amplitude of the transducer response strongly depends on the distance d between electrodes, transducer working area S, capacitance C, and damping factor B. Naturally, the sensitivity of conical wide-band probes is lower than that of the standard resonant transducers, since their effective working area S (cone base area around the shortest distance between electrodes) is smaller, the effective distance d between electrodes is larger, and the capacitance C is less. Moreover, because of the damping coefficient (B 1) for conical wide-band probes their sensitivity decreases even more in comparison with standard resonant transducers since there are no resonant standing waves in the conical piezoelements. However recall, that due to the same reason, the relative amplitude sensitivity of any highly damped transducer is always less than the sensitivity of a similar resonant probe. In general the estimate based on formulae (1)-(9) shows that the relative amplitude sensitivity of the developed wide-band conical transducers with non-uniform electric field should be ~ 2-5 times less than sensitivity of mechanically highly damped probes and ~ 5-20 times less than the sensitivity of resonant transducers. That is the price for a short pulse and high axial resolution. Experimental results, obtained by measuring response amplitude in the PE mode for various resonant, wide-band conical, and mechanically highly damped transducers, confirmed the correctness of the obtained values. Thus the relative amplitude sensitivity of the developed collimating and wide-band conical transducers is typically lower than the sensitivity of standard focused and resonant probes. However, this conclusion is valid only if one uses the definition of sensitivity as a ratio of the output signal amplitude to the input signal amplitude. But sometimes it is more appropriate to understand probe sensitivity in a more broad sense, as an ability of the piezotransducer to detect and characterize a weak UT indication related to some specified flaw (e.g. flaw small in lateral direction and shallow in axial direction). In such a case the probe sensitivity depends not only on the ratio of amplitudes of the output and input signals, but also on the lateral and axial resolutions of the transducer and its signal-to-noise ratio. It is clear that such sensitivity is determined by the ability of the probe to focus acoustic power in a small volume in the external medium, to receive UT response only from this small volume, and to create a short UT pulse (wave packet) in the transmission mode and short electric pulse in the reception mode. (Note that in the best-case scenario for very wide-band transducers, the output UT pulse in the transmission mode and the output electric pulse in the reception mode should reproduce without distortion the excitation electric pulse from a spike-generator typically used in the commercial UT pulser-receivers). As a result, the collimating and wide-band conical transducer will be able to detect and characterize a small shallow flaw, which standard non-focused and resonant probe cannot detect and evaluate. This means that collimating transducers with logarithmic lenses and wide-band probes with non-uniform electric fields are more sensitive than standard non-focused and resonant probes. However the collimating transducers are less sensitive in comparison with standard focused probes because of the longer focal zone. Acoustic lenses with logarithmic profiles forming narrow weakly diverging ultrasonic beam were computed. Collimating transducers with such lenses were designed and manufactured. These probes were made from different piezoelectric materials; they had round and rectangular shapes, various sizes and center frequencies. The logarithmic lenses were axially and cylindrically shaped. Besides the immersion probes, a few contact transducers with removable acrylic delay lines and logarithmic lenses on its top were manufactured. The acoustic fields of different collimating probes with various logarithmic lenses were measured in an immersion tank in PE mode. The obtained results clearly demonstrate that transducers with logarithmic lenses create narrow collimated acoustic beams, thus providing high lateral resolution of the UT inspection system. The length of focal zone and UT beam diameter depends on the shape of the lens, probe aperture diameter, and center frequency. If transducer aperture diameter and center frequency are fixed, than beam diameter and length of the focal zone can be controlled by changing the shape of the lens. Logarithmic lenses can be employed in very different types of transducers: immersion and contact, spherically and cylindrically focused, high and low frequency, large and small, non-damped and highly damped, and so on. Wide-band conical piezoelements with a non-uniform exciting electric field were computed. Transducers with such piezoelements were designed and manufactured. These probes were made from different piezoelectric materials and had various sizes and electrodes placement, they could work in contact and immersion modes. 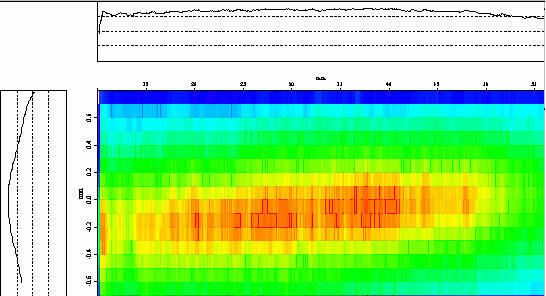 The frequency responses and spectra of different probes were measured in an immersion tank in PE mode. The obtained results clearly demonstrate that conical transducers with non-uniform electric fields are very wide-band probes and can transmit and receive short UT pulses with rather high signal-to-noise ratios, thus providing high axial resolution of the UT inspection system. The bandwidth depends on the shape of the piezoelement and the placement of the electrodes. By changing these parameters, the transducer bandwidth can be controlled. Moreover, depending on the application these low-noise wide-band probes can be used with approximately equal efficiency as both low and high frequency transducers. Such transducers can be immersion and contact, focused (spherically, cylindrically, etc) and unfocused, round and rectangular, large and small, and so on. Two useful features - the wide frequency band and the ability to create a narrow collimated beam - can be combined in one probe. Conical transducers with non-uniform exiting electric fields and logarithmic acoustic lenses can be employed as a wide-band collimating low-noise probe. Relative amplitude sensitivity (ratio of the output signal amplitude to the input signal amplitude) of the developed collimating transducers was theoretically estimated and measured. Their sensitivity is approximately 2-10 times less in comparison with the sensitivity of standard spherically focused probes, since the latter are specifically designed to concentrate UT power within very small axial range. In comparison with standard non-focused transducers the collimating probes with logarithmic lenses provide gain ~ 2-10 times depending on the length of focal zone, transducer frequency and aperture diameter. 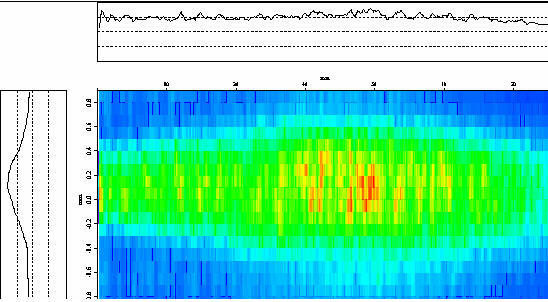 Relative amplitude sensitivity of the developed wide-band conical transducers was theoretically estimated and measured. Their sensitivity is approximately 2-5 times less in comparison with the sensitivity of mechanically highly damped probes and ~ 5-20 times less than the sensitivity of resonant transducers. This happens because wide-band conical transducers with non-uniform electric fields have a very low damping coefficient, comparatively large effective distance between electrodes, rather small effective working area, and small capacitance. Karpelson A., "Piezotransducers creating narrow weakly diverging ultrasonic beams", e-journal of NDT, vol. 7, No. 6, June 2002. Karpelson A., "Wide-band ultrasonic piezotransducers with non-uniform electric field", e-journal of NDT, vol. 8, No. 8, August 2003. Standard Guide for Evaluating Characteristics of Ultrasonic Search Units. ASTM Standard E-1065, 1999.